Juan Antonio Flecha finished third in Paris-Roubaix today in France and finished off an aggressive debut by Great Britain’s Team Sky. Spain’s Flecha formed part of an elite group of riders as the race made its way north to Roubaix’s velodrome. Unfortunately, he and his rivals had no answer to an attack by Switzerland’s Fabian Cancellara (Saxo Bank) with 48 kilometres to race. The three-time time trial world champion rode solo and continued to gain time, winning by two minutes. “Tom Boonen was attacking too, but I think Fabian said, ‘Okay, now it is my turn,'” Flecha told Cycling Weekly. “It is true that it was far way, but he did the right move. 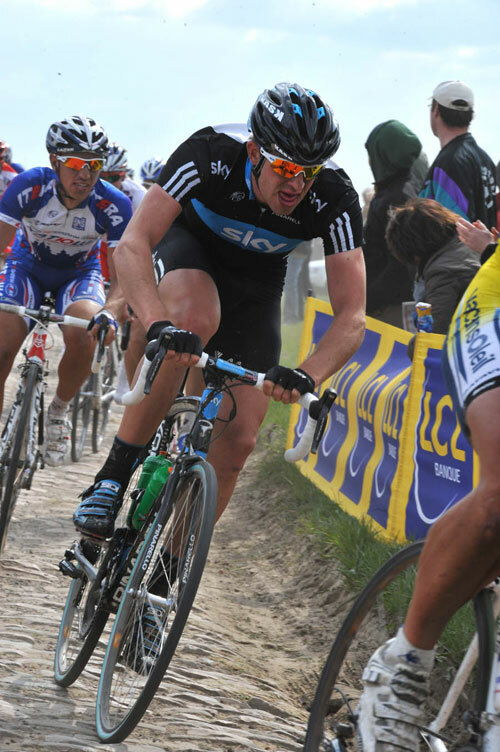 This is Roubaix, after 200 kilometres everyone will start to look at each other, but not Fabian. He just opened the gap and kept on going, he gave everything. Flecha resigned himself to a podium spot and fought to limit his competition, namely Boonen of team Quick Step. He attacked in the Cysoing à Bourghelles cobbled sector and a second time, following a move by Roger Hammond (Cervélo Test Team). Flecha rode clear with Thor Hushovd (Cervélo Test Team), who won the two-man sprint for second in the Roubaix velodrome. “There are a few things on the velodrome we could learn about sprinting,” Brailsford added with a smile. “In a sprint you can always have a chance if you know what you are doing and to be honest I am a little bit frustrated. Sky’s Greg Henderson and Chris Sutton took the pressure off Flecha by being in the early 19-man escape group. Mathew Hayman, Michael Barry, Geraint Thomas and Ian Stannard helped with the work later and all completed the race, though Stannard finished outside of the time limit.